The Duchess of Cambridge regularly pays subtle homages to her husband’s late mother Princess Diana – through her clothing, parenting techniques, lifestyle choices and more. They are touching tributes to her children’s grandmother, who they never got to meet. In 2016, Kate seemed to give a nod to Diana with the wide-brimmed John Boyd hat that she wore for the annual Commonwealth service. Mr Boyd was one of Diana’s favourite milliners! Although Mr Boyd started working for the royal family in 1967, the hat maker saw his popularity peak when Diana sported his headgear on a regular basis in the eighties. While Diana never saw the birth of her grandchildren, William and Kate found a truly touching way to remember the Princess when their daughter was born last year. The couple chose to name their second child after Diana and gave her the full name Charlotte Elizabeth Diana. Apart from the connection with William’s mother, the sweet moniker also paid tribute to Her Majesty the Queen. Elizabeth is also the middle name of Kate and her mum Carole Middleton. 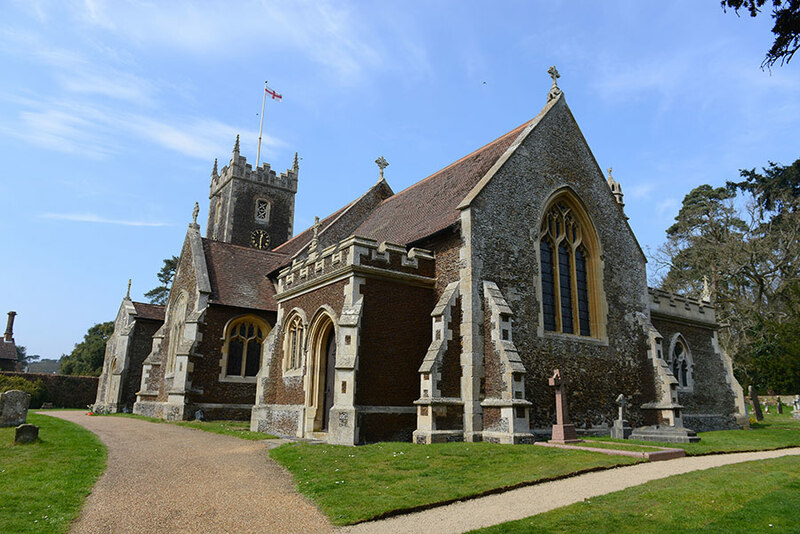 After naming Princess Charlotte after Diana, William and Kate went one step further and decided to baptise their little girl in a venue that holds a special place in their hearts – St Mary Magdalene Church in Sandringham. The church, which is located on the Queen’s Sandringham Estate, is the same place where Diana was christened in August 1961. Cradling her newborn son in her arms as she faced the media on the steps of the Lindo Wing at St Mary’s Hospital in London, Kate called to mind Diana when she presented her first child William to the world back in 1982. 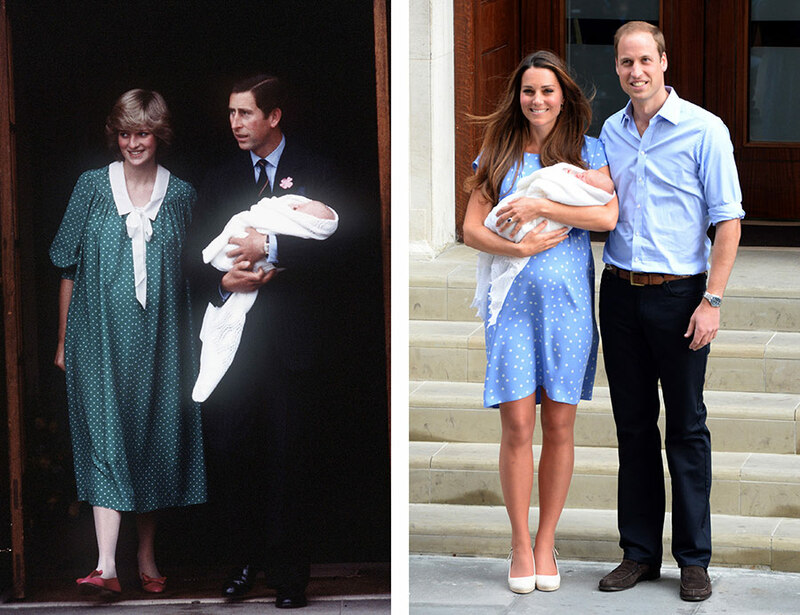 The Duchess wore an empire line, polka dot blue frock for her first appearance as a mum; Diana left hospital in a similar dotted dress by Catherine Walker. Given that Kate’s dress was made especially for her by one of her favourite designers Jenny Packham, the similarity between the two outfits was probably no coincidence. Just as returning to the same hospital where William and Harry were born was a deliberate choice to honour a family tradition. When Prince George attended his sister’s christening last July, the youngster was dressed head-to-toe in an outfit similar to what his dad William once wore as a child. 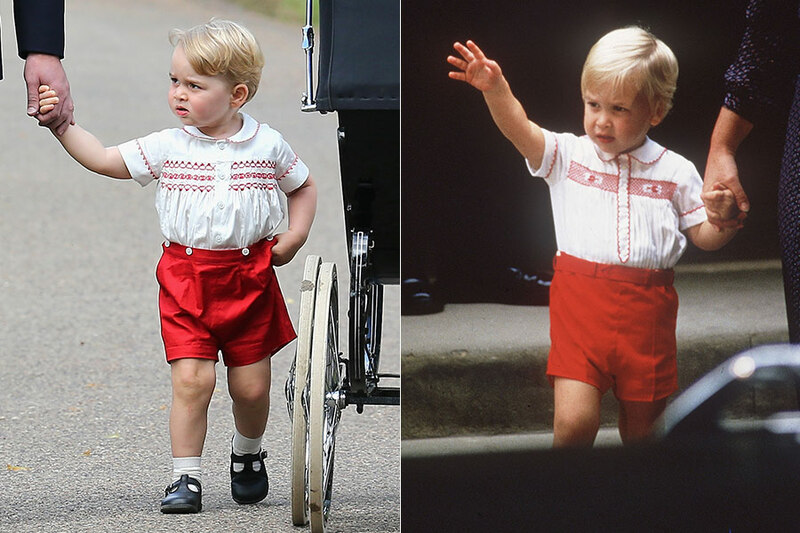 Clad in an embroidered white shirt and red shorts, George was the spitting image of his father when William went to the hospital to meet his brother Harry for the first time in 1984. 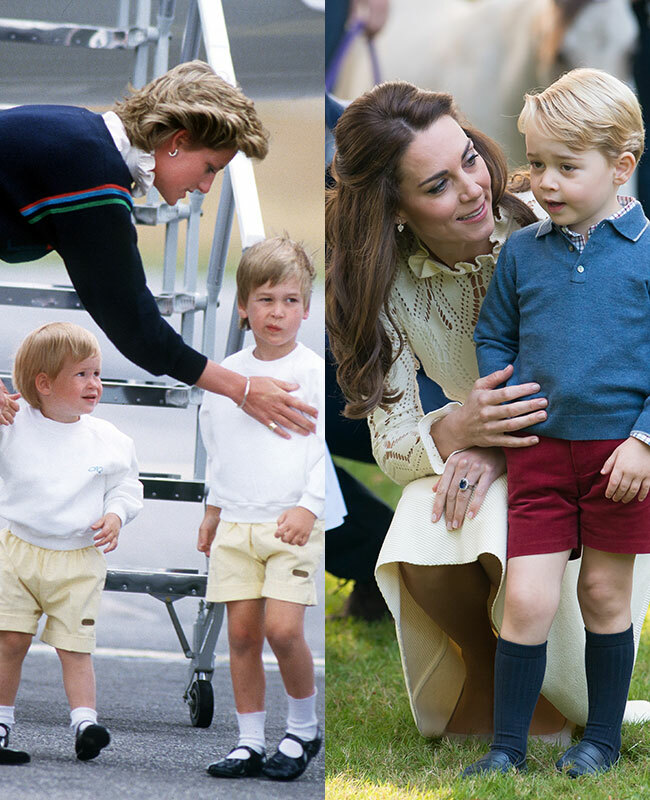 Rachel Riley designed George’s outfit, and admitted that she spotted similarities between the way Kate and Diana dressed their children. This wasn’t the first time George had drawn comparisons to his father William. 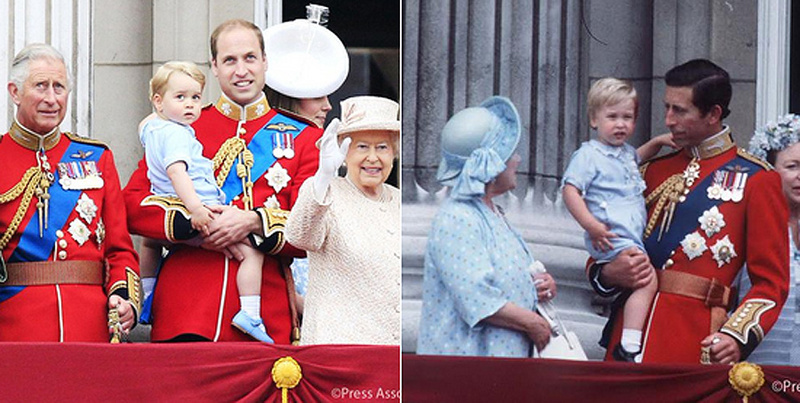 A month earlier in June at the traditional Trooping the Colour ceremony, George wore the exact same pale blue outfit that his dad William wore back in 1984 for the Queen’s birthday. 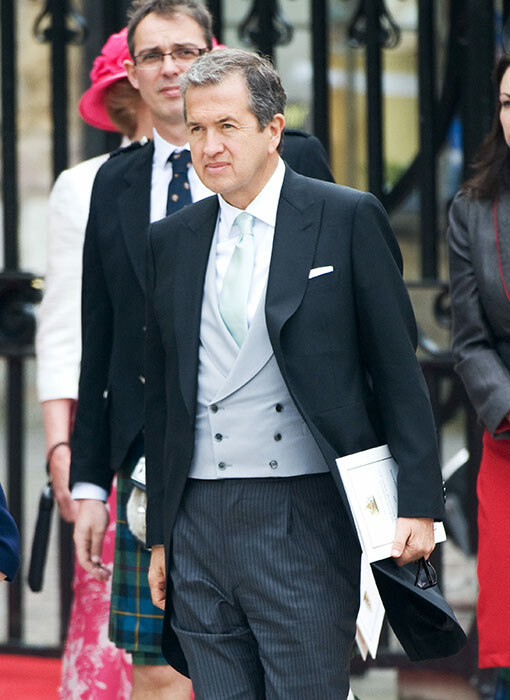 Held by his doting dad, George gave an adorable wave from the palace balcony to the well-wishers below. It was Diana who insisted that her children be educated outside the palace walls, so when the time came for William to start nursery, she enrolled him at Mrs. Mynors’ Nursery School in west London. Diana herself was a nursery assistant at the Young England Kindergarten school in Pimlico, a nursery that uses the Montessori method. It was therefore no surprise that she wanted her sons to be schooled in the same way – a teaching method that balances work and play and encourages children to develop at their own rate. 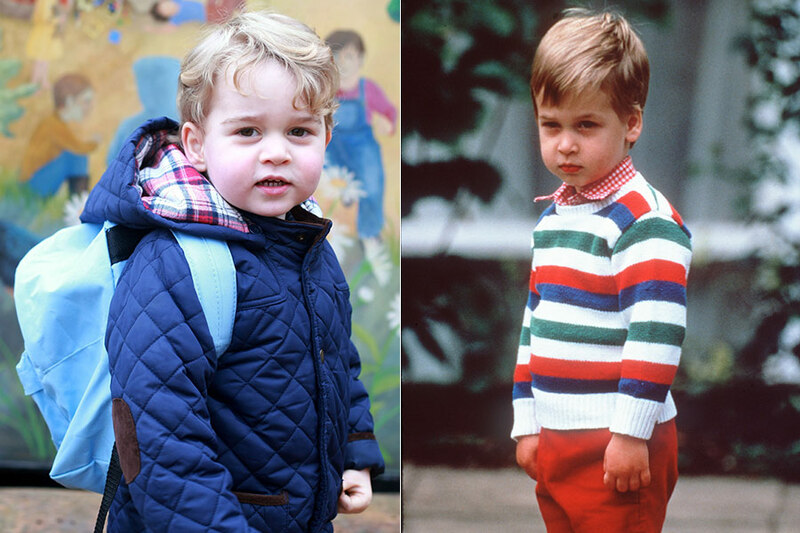 Fast forward more than 30 years and William and Kate’s son George is also attending a Montessori nursery. The little boy started at the Westacre Montessori School in Norfolk in January, and spends a few mornings a week there. Unbeknownst to the media and the public, William and Kate took their first secret holiday as a family of four in March. The Cambridges visited their favourite region in the Alps, where George and Charlotte experienced their first taste of snow. The official portraits that were released via Kensington Palace after the trip called to mind the family holidays Diana used to enjoy with her sons William and Harry. 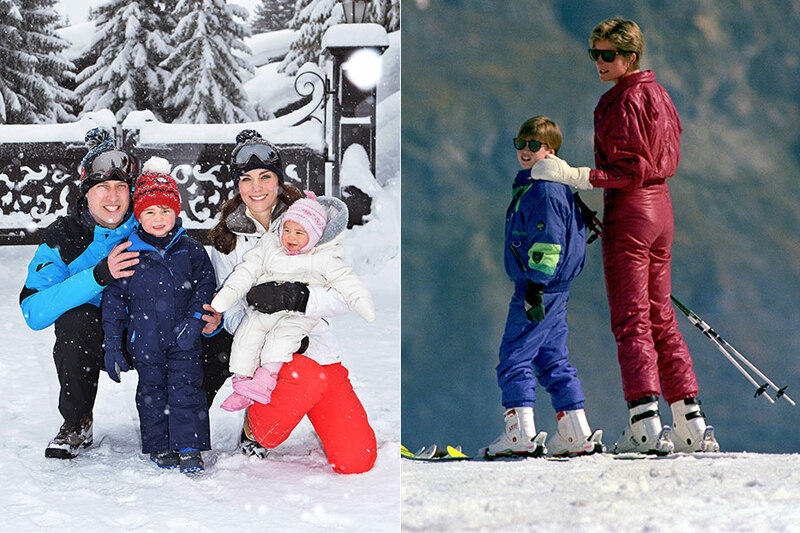 The Princess would take her children on winter breaks, often to Lech in Austria, where they practised skiing together and rode side-by-side on ski lifts. At almost every royal engagement Kate attends, the Duchess never fails to wear her impressive diamond engagement ring, which used to belong to Diana. 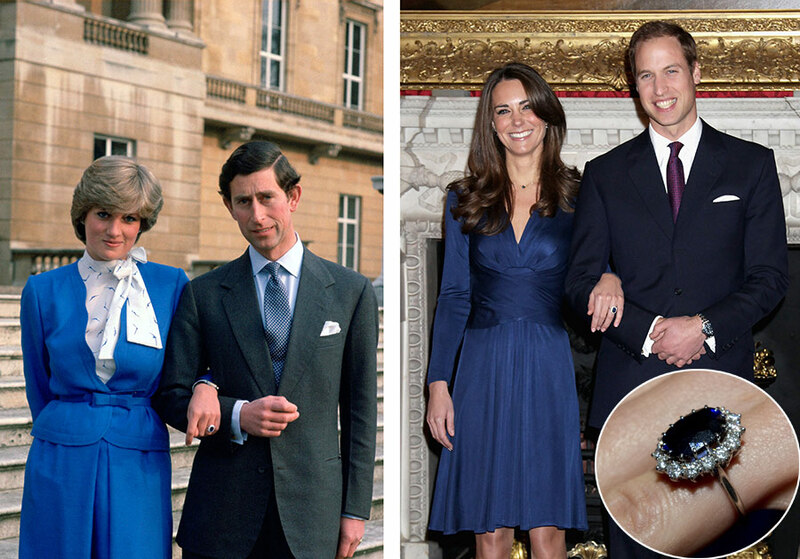 Back in 2010 Prince William popped the question to his future wife with his mother’s stunning sapphire accessory. The ring, which consists of a 12-carat oval Ceylon sapphire surrounded by a cluster of 14 diamonds set in white gold, was created by jeweller Garrard. At the time of her engagement to Prince Charles, Diana selected the ring herself from the jeweller’s catalogue; some have said that the Princess chose it because it reminded her of her mother’s ring. 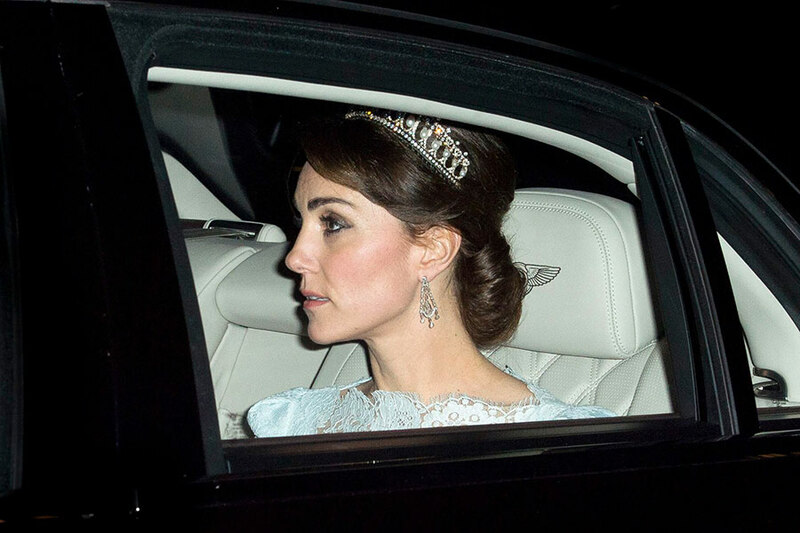 It was only the third time that she had worn a tiara in public but Kate seemed to have her late mother-in-law in mind when she attended the Queen’s annual diplomatic reception last December. The Duchess opted for the dazzling Cambridge Lover’s Knot tiara, which was a firm favourite of Princess Diana. Diana received this particular tiara as a wedding gift from the Queen in 1981. Because of its association with the Princess – and of course its Cambridge name – the beautiful design seemed very fitting for Kate to wear to the important event. Apart from her eye-catching engagement ring, Kate also owns another piece of jewellery that previously belonged to her late mother-in-law. 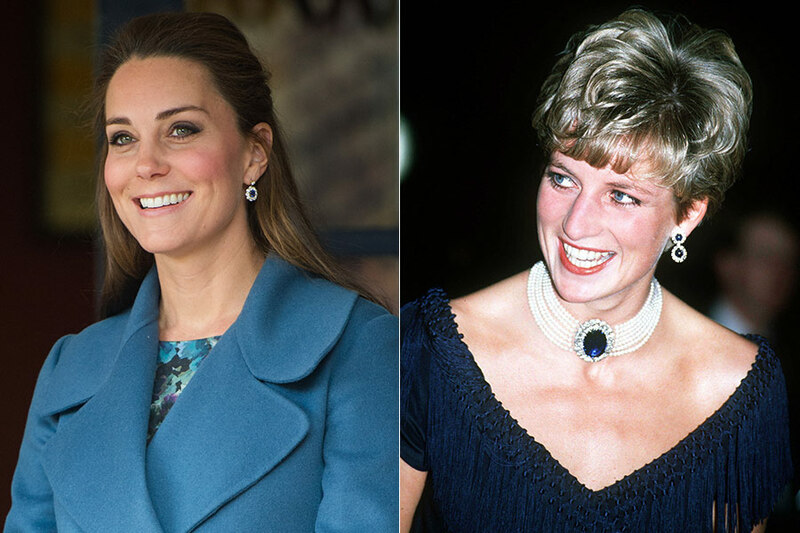 Shortly after William and Kate married in 2011, the bride was presented with some beautiful diamond and sapphire drop earrings, which match her engagement ring and originally belonged to Diana. They were remodelled for the Duchess who wore them for the first time when she and William watched Andy Murray from the Royal Box at Wimbledon in 2011. 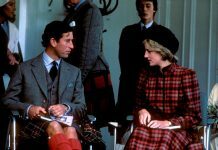 When deciding what to wear for her trip to Malaysia in 2012, the Duchess seems to have turned to Diana for style inspiration. 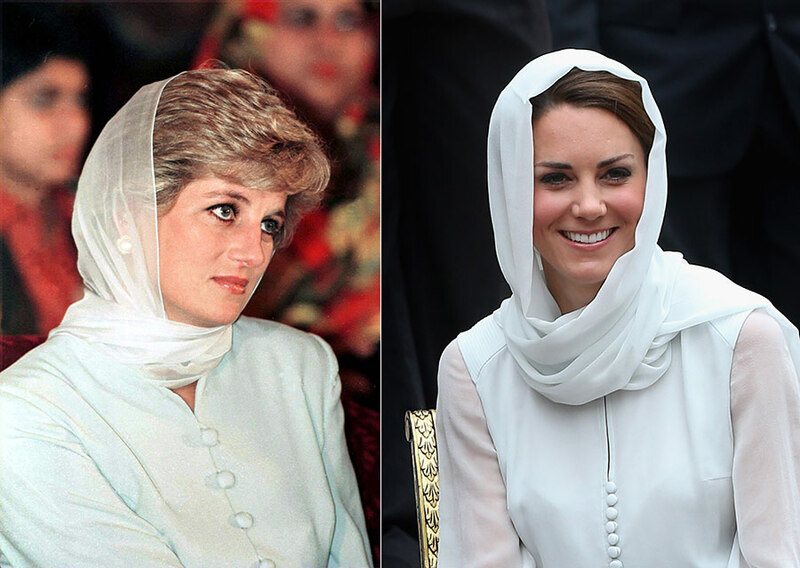 Kate covered her hair in a white headscarf to visit the Assyakirin Mosque in Kuala Lumpur, and wearing a similar silk buttoned-up blouse, the royal bore a striking resemblance to Diana when she visited Shaukat Khanum Hospital In Lahore, Pakistan in 1996. Diana’s most famous magazine spread was arguably her Vanity Fair photoshoot, which was taken by her favourite photographer Mario Testino. Taken just months before her untimely death, the shoot captured Diana’s beauty and elegance. 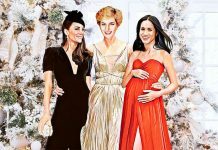 The British royals have commissioned the Peruvian artist ever since, and has most notably photographed some of William and Kate’s most special milestones. Mario was chosen as the official photographer for Princess Charlotte’s christening last July; he was also the creative mastermind behind William and Kate’s engagement photos. He added that William “is more like his mother” while Kate “is beautiful in a different way” to Diana.